The <footer> tag is used to describes the footer of a document or a section. In a single document, you can have several <footer> elements. A <footer> element typically contains the information about its containing element like authorship, copyright, contact, sitemap and related document. The <footer> tag supports Global attributes and event attributes. The <footer> tag belongs to flow content and palpable content. HTML 4 is does not support <footer> tag. HTML 5 is supports <footer> tag. 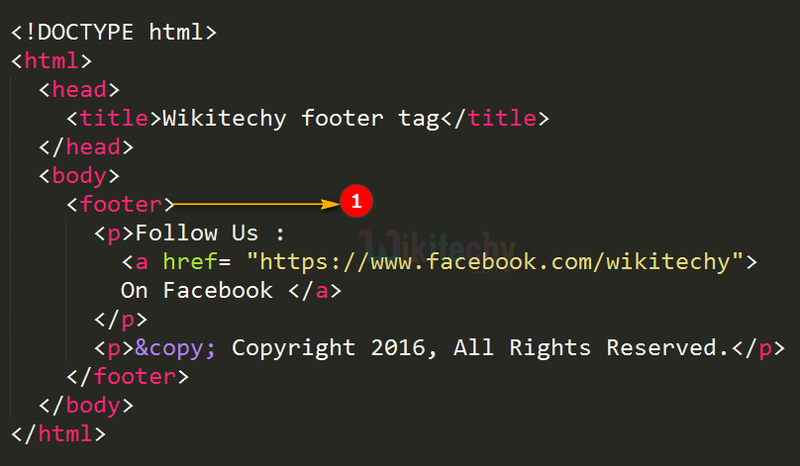 The <footer> tag is used to display Follow Us links and copyright information in the footer. The output shows Follow Us links and copyright information in the footer. When contact information typically contains within a <footer> element should go inside an <address> tag.